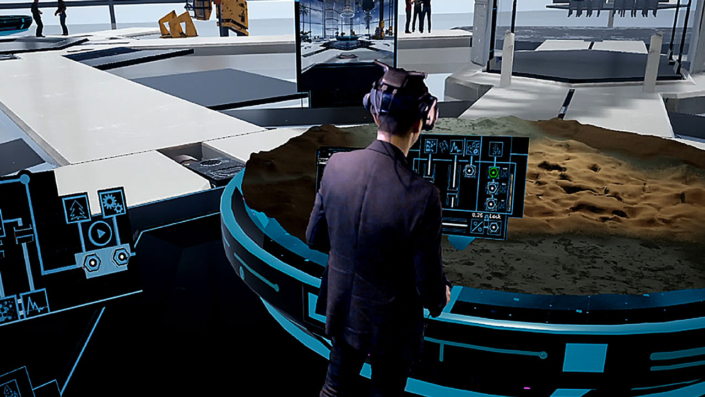 Virtual Reality (VR) is a computer generated simulation that, by using different technological approaches, creates a sensory illusion of being in another place, and allows users to interact with the fabricated experience. The most common method to achieve immersion is by the projection of the virtual feed on small displays inside a wearable device called a head-mounted display (HMD). In addition to the headwear, motion tracking technologies are used to capture body movements, making it possible to interact with and within the digital content. VR, as described in movies and sci-fi novels, is an alternate dimension accessible to users, while at times replacing reality, making people believe it is the real world. Many users who have tried low-cost VR technology, such as the basic mobile device VR wearables, excluding Gear VR, DayDream, and a few well-executed mobile VR solutions, will be happy to find that high-end VR technology matches their initial expectations for what VR should be. Three degrees of freedom, which is what is offered by most VR HMDs, can cause motion sickness. This problem is avoided by using high-end systems such as HTC Vive, Oculus Rift, and VIVE Focus; all offering six degrees of freedom. We’re setting a goal: we want to get a billion people in virtual reality. The VWGen is NetVRk’s core which enables users to automatically generate virtual experiences and environments without the necessity of writing a single line of code. The algorithms that generate the procedural terrain also populate it with the built-in assets from the VWGen’s database requiring only VR gear and the average person less than five minutes. Users can then navigate and interact with the virtual environment to start building atop of in NetVRk. The user interface and control panels resemble familiar devices such as levers, buttons, keys, and in general, real-world tools that users likely operate with on a daily basis. Therefore, users can immediately and intuitively start building their VR space. The Unreal Engine is a source-available game engine developed by Epic Games, first showcased in the 1998 first-person shooter game Unreal. Although primarily developed for first-person shooters, it has been successfully used in a variety of other genres, including stealth, fighting games, MMORPGs, and other RPGs. 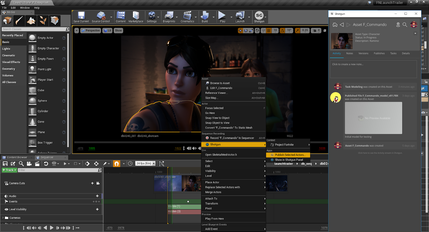 With its code written in C++, the Unreal Engine features a high degree of portability and is a tool used by many game developers today. The current release is Unreal Engine 4, designed for Microsoft Windows, macOS, Linux, SteamOS, HTML5, iOS, Android, Nintendo Switch, PlayStation 4, Xbox One, Magic Leap One, and virtual reality (SteamVR/HTC Vive, Oculus Rift, PlayStation VR, Google Daydream, OSVR and Samsung Gear VR). 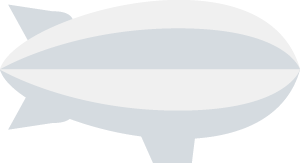 Have any questions regarding the project or STO? Feel free to get in touch! XMOD, INC., will offer multiple downloadable version of NetVRk on different devices, VR and non-VR alike. NetVRk will be supported across multiple platforms; connecting desktop, mobile, and in general, non-VR users with VR users. As mobile phones can’t run performance heavy programs such as NetVRk, users on mobile devices will have fewer features, while still being able to interact with a user that is connected over the PC, and communicate through a voice/chat interface. Very much like with the successful title “Fortnite”, which enables its users to interact with others using a diverse number of forms of media and operating systems. In the near future when 5G, the fifth generation of cellular mobile communications technology, implements across all mobile networks, users will be able to access all NetVRk features from their mobile phones. 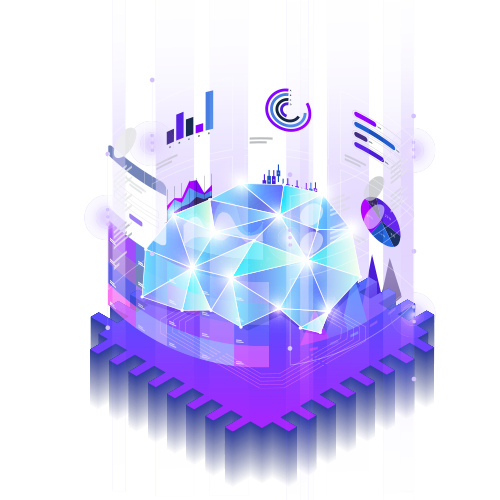 NetVRk will use AI for a variety of tasks, such as analytics, real-time assistance, search optimization, security, content moderation, and other features as the platform evolves. By way of machine learning, the AI will improve itself from real user interaction to create the perfect virtual companion that later can be used for personal and business uses. The fact that the AI in NetVRk does not rely on computer vision and other physical sensors in order to capture human data, but instead directly analyzes movements, speech, while obtaining a massive amount of user behavioral data and more, will help greatly to rapidly advance its capabilities. To give a taste of the possibilities, below are a few additional interesting scenarios and use cases possible on the platform. To enable these scenarios, XMOD, INC. is establishing collaborations with prominent companies, which will incorporate their services into NetVRk’s ecosystem. Users will be able to enter stores and purchase actual goods from retail companies, peer salespeople, or sophisticated Artificial Intelligence (AI) dealers. 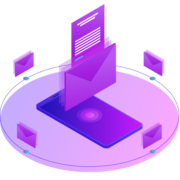 The stores can be dynamically created by putting together the offerings of a number of different vendors and catalogs based on the user’s desires. For example, a user will go into a shoe shop, and the shoes presented to them will be based on his or her shoe size, color of choice, design, etc. The options will be influenced by the user’s previous purchases (if they choose to share them) as well as what other users with similar profiles have purchased. Users can shop virtually for hotel rooms, vacation rentals, and even real estate. We all know that being in a place is very different from seeing selectively positioned pictures of the place. NetVRk will enable you to walk around a location, fully experiencing it, so that you can better determine if this is the right place for your vacation, or even for your next home. Users will be able to “try on” a piece of clothing and look into a mirror to see how it looks on them. They will be able to change outfits and view the item with different accessories. The same can be done with furniture in a user’s actual digitized version of her real apartment, a picture frame, or any other item that one would purchase that must harmonize with other items the user already has or plans to purchase. To do all this, a user will take advantage of their digitized avatar, allowing them full integration with the system, while keeping the level of anonymity they are comfortable with. Users experience a real car-buying experience. After evaluating the user’s desired options and colors, the user can sit in a car, hear the engine, see the dashboard, check the visibility in the rear window, and go for a test drive on a highway or crowded city street. Users will be able to spend time with their peers in the VR world. They will be able to throw a party, have a social gathering, attend a meeting, and go to a dance club or museum, either with friends or alone so that they can meet new people at their destination. 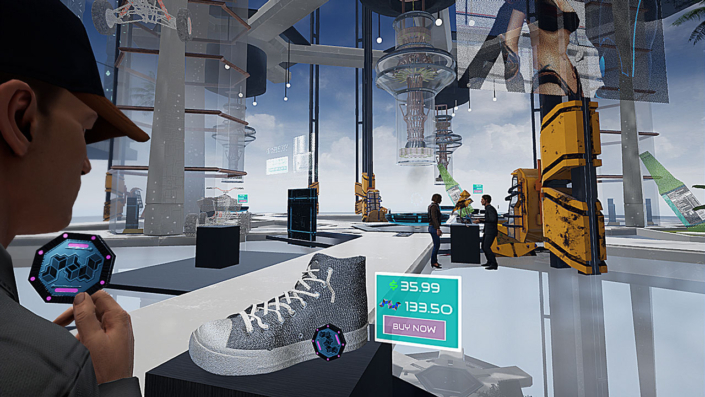 NetVRk’s platform will host the next generation of personal journaling, VR-based logging or VRlogging, creating a real-life feeling of engagement with the experience. 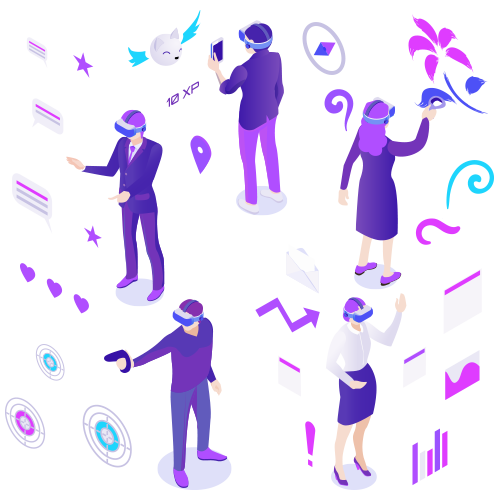 The VR bloggers will be able to communicate with their audience in a personalized experience, including recording their 3D avatar for content generation. VRlogging can be as simple as importing videos and images into the system and recording a presentation, or using 3D models (purchased from the database or self-created), to produce a more advanced experience such as 3D training in building a plane or an engine with the VRlog audience. We expect that NetVRK’s users’ ideas and projects will go way beyond the limits of our imagination. 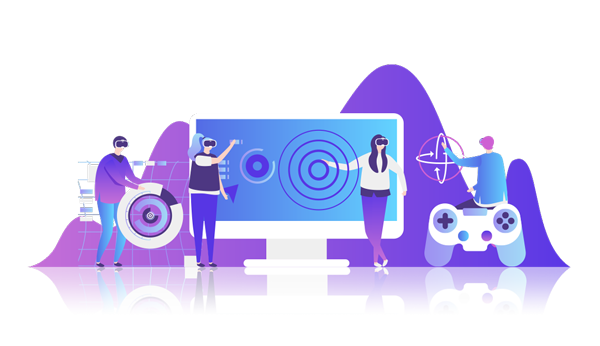 Users from the gaming community will be able to design a gaming experience with ready-to-use “drag and drop” decorative and interactive gaming assets from NetVRk’s VWGen database, and create unique gaming experiences and scenarios that will appeal to the large audience of gamers. VR allows for new ways of administering cognitive behavioral therapy ( see external reference ) and exposure therapy in a safe and controlled place. Both of these methods are highly effective for conditions such as anxiety disorder, panic disorder, phobia, PTSD, and obsessive-compulsive disorder. Virtual Reality therapy sessions are still being studied and evaluated. NetVRk’s platform provides a unique opportunity to carry out medical research to fully establish the VR therapy protocol. The tools that lecturers and presenters have with NetVRk makes higher education accessible to everyone, everywhere. Imagine learning about the human genome while actually seeing and manipulating a 3D DNA structure. 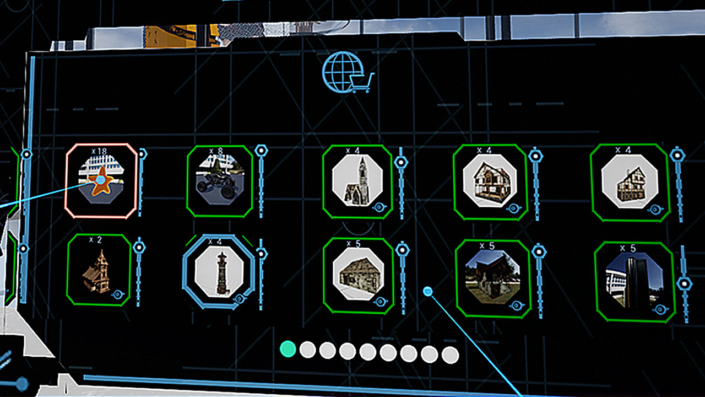 Museums will be replicated and integrated into the system for users to visit and learn. Moreover, a large variety of private lessons and private tutors will be available at all times, and content can be easily modified to match the student’s needs. Travel agencies could open a VR travel agency on the platform, where they will be able to show users what it is like being in the desired destination by taking them through 360-degree movie clips and images of the locations, which they can simply upload into their NetVRk travel agency “homepage”. They can also create a more immersive experience by hiring a 3D designer or XMOD, INC., who will create a custom three-dimensional representation of the destination for users to experience while interacting with the environment as if they were there. Movies and concerts could be experienced on NetVRk within a far more immersive way than what is currently possible using a two-dimensional screen. In future movies, users will be able to be a part of the movie and not just the viewer. Users will also be able to attend a live event broadcast in a 360-degree video right from their living room, choosing the best seats to view the show. Any live event captured by 360-degree video equipment can be integrated into the platform. In case the event was recorded by 3D capturing cameras, users, while in VR, will be able to even walk on the stage next to their favorite musicians and performers, which is not possible with a regular 360-degree recorded video. Painters, sculptures, and other artists are already starting to utilize VR’s possibilities for making an artistic statement and even experimenting in live paintings, immersing the viewer into the creation. Users will be able to enter the painting and explore hidden “treasures” the artist planted, see how the sculptures come to life, and much more. Sport fans will be able to attend live events in 360-degree videos, and watch their favorite athletes just as if they were in the crowd. They will even be able to swipe between multiple 360-degree video feeds in real time, getting a real taste of what it is like to stand on the grass from a soccer player’s perspective. NetVRk users will as well be able to practice sports by accessing immersive content available for download to all users, such as sport training simulations, and so on. Take a look at NetVRk’s latest content previews! Updated frequently so check back often! Sign up for the NetVRk newsletter to receive the latest updates about the project and STO. © Copyright - XMOD. INC.